Happy Labor Day to all of you! I hope you’re doing something fun with your friends and families. I didn’t do any yardsales this week, getting ready for my own. But, I did go out a few weeks ago to an antique store here in town that I love to browse, Hanna Antiques Mall, downtown Birmingham. It’s always fun to see what’s out there. Plenty of shabby chic and aqua painted furniture is out there. All the dealers have caught onto the trend too. Do you think they read all these blogs? I think so! Love this pretty and soft aqua headboard. And this one too. Blue and white stripes for a beachy look. Plenty of white. I loved this open shelving, lots of possibilities for it. A weathered old table. This piece really caught my eye. I’m seriously thinking about selling my sideboard and getting something like this beautiful hutch to hold my white china pieces. I think I would want it even more open on the top, but this one was pretty. Another white hutch. Loved this old door made into a headboard. Cloche on a stand. Bamboo etageres are really popular. I’ve seen these all over the magazines. Blue Ball jars too. Don’t we all love these? Love this shabby corner cabinet. This isn’t tall, but meant to be hung on the wall in the corner. Pretty cute piece! Loved this whole area with its gardeny things. Adored this old shelf. And wouldn’t this be easy to make with the right materials? An old shutter, brackets and a shelf on top. I’m taking notes! Love this pretty chair too, can’t you see it with some fresh new fabric? Another pretty old hutch. Transferware in shades of purple. You don’t see this color every day. Pretty set of chairs. If I was looking for dining chairs, I would definitely scour the markets first. And these old beauties! So pretty & would look great updated with fabric. This huge hutch was not for sale, but oh how pretty it is. Nifty idea for updating maple without painting the whole piece. Black and white transferware. Old shutters. Be still my heart. Pretty window display. Vintage hutch and lots of kitchen eye candy. At one other stop, I thought these drapery panels were very pretty. So botanical. And I bet they are from the 60’s. Just goes to show, you should check out vintage drapes when you go out browsing. I can see these working right now and freshening up a space! The Living With What You Love book giveaway winner is #138, Joyce Ackley. Joyce, please email me with your mailing address and I’ll pass it on so that you can get your book. Enjoy! REMINDER: Layla and I are having a HUGE yardsale on Saturday, September 11th, at my house in Birmingham, so if you are in the area, I hope you’ll come on out and see us. It’s going to be a LOT of fun and we will have a TON of stuff, between the 2 of us. So much beautiful stuff there. I especially love the dressers (hutches) and in particular the one with the curved top that wasn’t for sale (of course!). I have a lovely, but fairly bashed up, pine dresser which is begging for a makeover. I love some of those paint treatments. One of each, please! Beautiful finds! but were the prices just as “beautiful”?! I think that door headboard is the best. What a fabulous idea. I love seeing what a store looks like in your neck of the wood, especially seeing the prices. What a wonderful antique shop! That blue headboard is adorable and what a cool white hutch with colorful handles! How beautiful are those china cabinets and hutches! I LOVE the one that wasn’t for sale with the rounded top. Those also gave me an idea to update my china cabinet. I am too scared to paint the whole thing, but the inside back wall would be easy to do! And we are about to get new shutters…you have given me an idea of what do make out of them! Shelves! “Do you mean to tell me that my children have been traipsing around Salzburg dressing in curtains”. Oh my goodness….love all the blue, grey and white. I’m so inspired to paint everyting in my house. Thanks for all the pretty pictures! Great pictures. There are some really cute items here. 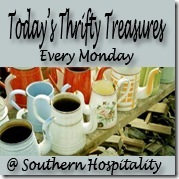 I love the idea of shopping for old, vintage things to decorate the house and kitchen. I love hunting unique items and love the vibes and story each of these items have. Oh Rhoda! What fun you must have had! I could spend hours browsing through shops such as you are picturing. It is such a treat to see so much in one place! Hi Rhoda! I just love all the pictures from Hanna and feel sure that I will be making a stop by there soon! My mom and I are interested in coming to your yardsale and I am afraid I will miss the ad in the paper. Would you please send me your address? Thanks! Can’t wait to see what all you and Layla will be offering! I’m in Bham too, love your blog & would love to come by your sale. Can you send me your address? Thanks! I live in Pelham on Highway 119 and would love to come to your yard sale this weekend. I’ve followed your blog for a while now, and have admired your work since you were on the garden web forums. May I have your address as well? I saw many items that would be on my wish list. so many beautiful things! really beautiful photos. i wish i could come to your yardsale – i hope you take a bunch of photos!